We trade our strategies with our own money. ​Our strategies are at the forefront of commodity research and index technology. ​With each strategy, we aim to extract one risk premium only. ​Our strategies trade deferred contracts to reduce strategy volatility, skew, and kurtosis. Our strategies are deemed UCITS eligible Financial Indices (ESMA/2014/937/#49-62). ​The J8 Commodity Momentum Strategy may serve as a benchmark for trading commodity markets based on momentum. The strategy is deemed to be UCITS eligible. ​The J8 Commodity Carry Strategy may serve as a ​benchmark for trading commodity markets based on term structure arbitrage fundamentals with a tactical participation in up-trending markets. The strategy is deemed to be UCITS eligible. ​The J8 Commodity Inventory Basis Strategy may serve as a benchmark for trading commodity markets based on basis as measure of inventory fundamentals. The strategy is deemed to be UCITS eligible. 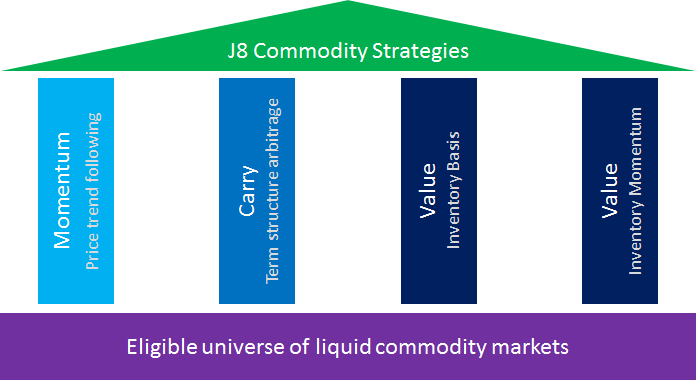 The J8 Commodity Inventory Momentum Strategy may serve as a benchmark for trading commodity markets based on momentum as measure of inventory fundamentals. The strategy is deemed to be UCITS eligible. ​The risk of loss in commodity interest trading can be substantial.